FRESNO COUNTY, Calif. – As the weather heats up, crews are getting ready for wildfire season. Multiple agencies came together during Fresno County Fire’s spring exercise to sharpen their skills. Tuesday, they were out training at Millerton Lake. 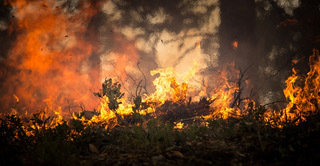 Firefighters said last year the heavy rainfall brought on some of the biggest fires. This year, they anticipate another busy season because of the late rain. from the Detwiler and Railroad Fire to the Mission Fire. So before another busy season begins, Michael Bowman, a battalion chief with Cal Fire for the Fresno County Fire District, said, “We discuss lessons learned that happened throughout the state or local fires that we had”. Then it was out to the field. Fresno County Fire hosted a number of exercise drills at Millerton Lake. From firefighters deploying hose lines and fire shelters, to taking water from lakes, ponds or other sources of water nearby. “We use engines to draft water especially in these rural areas where we have to use a canal or a lake or a portable tank to draft water out of,” Bowman said. Drone footage showed the dry vegetation. Crews said they are also training how to react when the wind changes direction. “The more we can do this the better we are,” Bowman said. Now two weeks ago, Governor Jerry Brown proclaimed “Wildfire Awareness” week. Fresno City Fire said they have already had 67 vegetation fires just in the month of May.